On the evening of April 7, 2019 Tracy passed away at home in Miles City, MT with his family by his side. Tracy was 62 years old. Tracy Lee Rhoads was born June 9, 1956 in Miles City, MT to Frank “Dusty” and Mary Rhoads. He had 4 brothers and 4 sisters. He grew up and finished school in Miles City. He later took a nice paying job with the railroad that would help fund his way to college in Bozeman, MT. 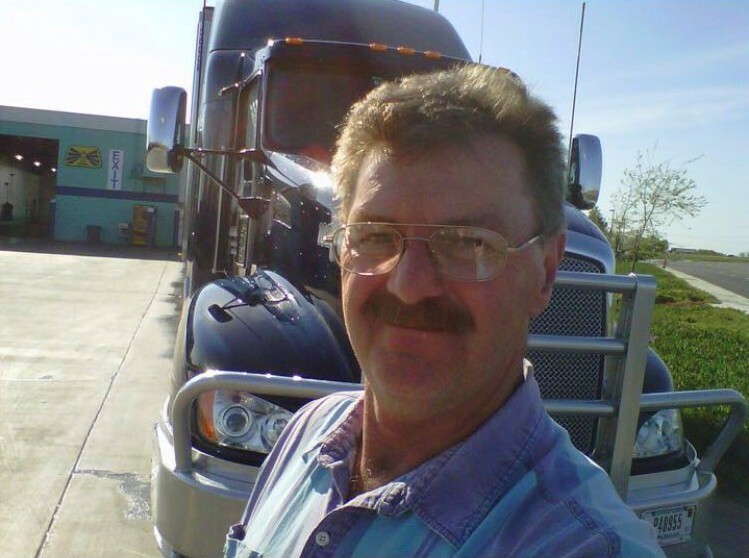 After college he started with a trucking company that he liked very much, but due to lack of hours and miles he was unable to continue. He moved to a job at the Miles City Green House where he worked for awhile. In this same time he would meet and marry his wife Michelle Rhoads on Sept. 9, 1985. Tracy and Michelle had a son, Dusty Lee Rhoads, two years later. He also raised his two step daughters Rachel Collins and JoAnna Palmer, like they were his own as well. Tracy would later move on from the Green House job to a seasonal job at the Highway Department. After this job he worked with Eastern Montana Industries for about 9 years. He enjoyed working with the handicap and special needs. After his years there Tracy took a job at K-Mart, until he finally got a chance to go trucking again. In 1999 Jerke Livestock hired Tracy and sent him out on the road where he spent the next 20 years, delivering stuff all across the country. He was loyal and dedicated to his job all the way till his final days. He was proud to be a trucker. Tracy loved his kids and his grandkids unconditionally. He was always happy to take them to Spotted Eagle, the dump, or simply do homework with them, and was always trying to explain pi. He tried to spend as much time as he could with them. Tracy loved his brothers and sisters. He was excited to talk cars and engines with his brothers and heck his sisters too, if they would listen. Frankly, he loved to talk about anything to do with cars just to about anyone. He was a very smart man and was always quick to answer all the Jeopardy questions (mostly) getting them right. Tracy is survived by his wife Michelle Rhoads of Miles City, Son; Dusty Rhoads (Margaret Roig) of Miles City, Daughters; Rachel Collins and JoAnna (John) Palmer of Miles City, and all his grandchildren; Colton Crow, Shiloh Raymond, Braedyn Palmer, Ashton Crow, Adyson Crow, Terren Rhoads, Khloe Palmer, Jaycee Palmer and Amera Rhoads, Brothers; Richard (Sharyn) Thomas of Billings, MT and Kelly Rhoads of Miles City, MT, Sisters; Taylor Sidell Trowbridge of Billings, MT, Mary Welch of Puyallup, WA, Dawn Rhoads of Miles City, MT and Melody Cooper of Miles City, MT, numerous nieces and nephews. He is preceded in death by his parents Frank “Dusty” and Mary Rhoads, Brothers; Glenn and Robin Rhoads. Tracy was a loving husband, good brother, a great dad, excellent grandpa, and a wonderful friend. He will be missed, but never forgotten. Memorial services will be held on Friday, April 12, at 2:00 p.m. at Stevenson and Sons Funeral Home in Miles City. Condolences to the family may be sent by visiting wwww.stevensonandsons.com. I am so sorry to hear about Tracy. He was a great guy!!! Prayers to all his family. Mary and Dawn, so sorry to hear of your brothers passing. My prayers and sympathy go to both of you and Tracy’s family. So sorry for your loss ! Prayers for the family! Michelle ,JoAnna and Dawn ,we are so sorry. All of you are in our prayers. Vern,Wanda and Leann Bankey. I have truley been blessed to have known this man. His heart, smile, and generosity was bigger them him. My heart goes out to Michelle and all the family. Sorry for the loss of your brother. I think of you often. I’m sorry for your great loss. My prayers are with your family. May your many memories give you joy. Michelle, Joanna, Dusty and family, I’m truly sorry for your loss and I will keep y’all in my prayers through this difficult time. If you need anything please let me know. He’s watching over you all now. May God hold you tight and comfort you. Rachel,Michell and remaining family, so Sorry for the loss of your Father and Husband. Prayers to all in this difficult time. I am so sorry for your loss. Special hugs to Dusty and Rachel. So sorry to hear about the passing of Tracy. Such a great family. Especially my thoughts for Dawn, you are a special personality. My deepest sympathy to the Rhoads family. I knew Tracy years ago growing up. My special sympathies to his sister, Dawn. I wanted to express my condolences to all of Tracy’s family. Right now your grief may be inconsolable, and any words of comfort may be inadequate. So I pray that the God of comfort supply you with strength to face today, and hope and peace to face tomorrow. One way that God comforts us today is by moving people who care about us to give us words of encouragement that we need to hear. For the Bible’s answers to questions about grief and death please visit JW.org. Mary, Dawn and the Rhoads Family, Sending prayers and condolences. Dawn, So sorry to hear about Tracy. Your in my thoughts and prayers. Sorry to hear of the loss of your husband, father and brother. You are in our thoughts and prayers. Sorry to hear about the loss of a good man. My thoughts and prayers 🙏 for all of his family. I knew him since I was younger and loved his sense of humor. May you rest in peace my friend. My thoughts and prays are with all of Tracy’s family and friends . May all your wonderful memories fill those tough days . Michelle, Dawn and family so very sorry for your loss of Tracy. RIP Tracy. I can’t believe he’s gone. I close my eyes and I see that little boy with the thickest head of hair, big brown eyes and the sweetest smile. He grew up to be kind, soft spoken, and never wanting to impose. Sometimes when Tracy’s job brought him to my neck of the woods, he’d call and come by for a visit, maybe just overnight or a few days depending on his schedule. We’d talk cars, electricity or just a trip down memory lane. My memories of the past, being 11 years older, was very different than his. I am so glad I had those opportunities. He was such a gentle soul and will be missed by many. Thanks to everyone who took the time to express their sorrow, it is appreciated. May the many precious memories you’ve shared with Tracy ease your pain in the days ahead. As you look forward to seeing her, young and healthy, in a world where you will be united forever, hold this promise dear to your hearts: “And he (Jehovah) will wipe out every tear from their eyes, and death will be no more, neither will morning nor outcry nor pain be anymore”. May comfort and the peace of God guard YOU during this sad time.